Audrey Hepburn, you all know I love her, so let's move on. Her style! She not only is in some of my favorite movies and gives me great hair envy, but she kind of makes me in "awe" of her effortless classiness and elegance (which are things that my awkward self looks up to a great deal...). So now as I shop around in stores I ask myself if Audrey would wear it or if the item is classy and timeless enough. Classiness and timelessness (woaw, hello "s's") are key in my style because who wants to be one of those trendy people from the 80's that looks back and maybe realizes that that hairstyle was maybe not the greatest choice... Yes, I want to be one of those classy people that never go out of style... is that too much to ask?... Just think! Audrey is most iconic for the 50's and 60's and is still admired for her amazing style 60 years ago! So I thought it would be fun and really interesting to put together two inspirational boards (one day and one night look) for all of us to gather inspiration (hence the name...) for how we can all apply Audrey's classic and timeless style to to today's day and age. You may realize from the outfits above that they are not spot on to any of her most admired looks, but that's the way I wanted them to be. I don't think we should try to imitate her outfits and style spot on but just try to keep her flattering clothing silhouettes and her simplistic lines, then personalize it all to fit our own unique styles (if maybe your style is not completely Audrey-esk). 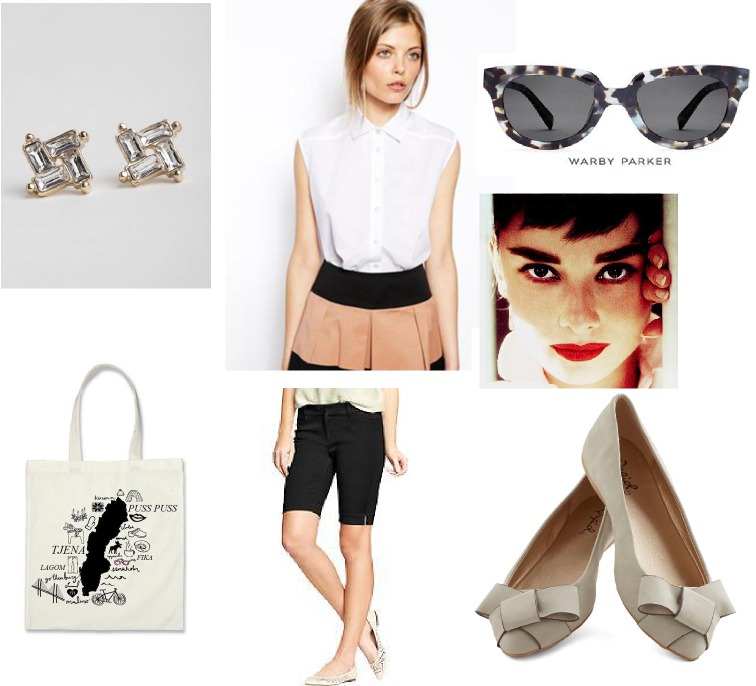 DAY LOOK: blouse, shorts, earrings, sunnies (cheaper version), Audrey's makeup inspiration, flats, and tote. NIGHT LOOK: dress, heels, earrings, purse, Tart Deco nail polish, and Audrey's makeup inspiration. Could you give me a list of some of your fav. movies please. Thank you so much, I have only seen a few of them so I will def. have to check the other ones out!!!!!! i love what you said about being inspired by her style + grace + classiness instead of trying to imitate exactly what she did. so good! Who doesn't love Audrey?! But I will say you've totally captured her style. Love.